The top 8 concepts have now been chosen in the 2010 edition of Electrolux Design Lab. The 2010 competition focuses on creative solutions for compact living. The brief asked industrial design students to consider how people will prepare and store food, wash clothes, and do dishes in the homes of 2050, when 74% of the global population are predicted to live in an urban environment. “With every passing year the standard of entries to the Electrolux Design Lab contest becomes stronger.” say’s Henrik Otto, SVP of Global Design at Electrolux. ”The eight finalists have made it this far on account of their ability to recognise and respond to the challenge of the brief and should be congratulated for innovative solutions that consider efficient use of domestic space”. Eight finalists will be invited to present their concept to a jury of expert designers on 23rd September at 100% Design in London. The jury will consider entries based on intuitive design, innovation and consumer insight when awarding the first prize of a six-month paid internship at an Electrolux global design centre and 5,000 Euros. A second prize of 3,000 Euros and third prize of 2,000 Euros are also on offer. The top 8 concepts have been chosen from designers based in eight different countries: Australia; China; USA; India, Iran, Russia, France and Sweden. 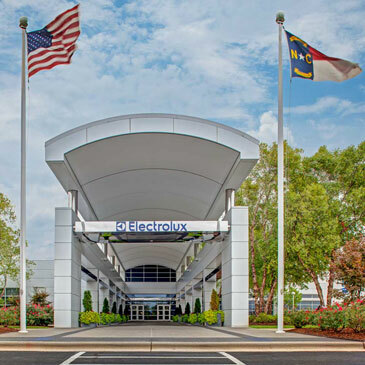 More information on the Electrolux Design Lab concepts can be found at www.electroluxdesignlab.com. The Kitchen Hideaway is a virtual reality concept that allows the inhabitants of a communal building to imagine being in a kitchen, preparing a particular meal rather than having to actually do this for themselves. The thoughts of the user are then transmitted to robotic chefs within the building who then prepare the visualised meal in a real kitchen and with real ingredients. In effect, the headset replaces the need for kitchen appliances in individual dwellings, saving space through creative thinking. The Snail is a portable heating and cooking device based on magnetic induction processes. Such is the size and versatility of the Snail, it can be stuck directly on to a pot, a pan, a mug etc. to heat the contents.This reduces the amount of space required for conventional cooking whilst adding portability to the process. Powered by a high density sugar crystal battery, the Snail converts the energy from the sugar, heating up a coil to conduct the magnetic induction process to the utensil. Integrated sensors detect the food type being heated so as to automatically adjust the time and temperature. A simple touch sensitive display with interface helps to monitor the process. Mathew Gilbride’s modular, wall-mounted appliance provides flexible modes of cooking, refrigeration, air conditioning, lighting, and environmental design whilst reducing space. The appliance draws power wirelessly through technology applied to the wall, which is supplemented through solar energy as required. Multiple units and surfaces automatically work together through wireless smart networking, whilst customisation is offered by being able to install the units as the user prefers. The Clean Closet is essentially a closet that washes clothing. Textiles are scanned for impurities and cleaned accordingly with molecular technology that removes dirt and odours. The concept replaces the laundry basket, the wash­ing machine, and drying cabinet to save space and, as no water is used in the process, is kinder to the environment. Lichen Guo identifies the conventional washing machine as an unnecessary occupier of space. The Dismount Washer addresses this by combining the cleaning vessel and laundry basket in one. The dirty laundry capsule is placed on a wall mountable motor (or ‘energy stick’) which takes up very little space. The energy stick also dispenses steam to aid the cleansing process. Henrik Otto, SVP of Global Design at Electrolux, was recently on CNN (25th June 2010) to provide a commentary on some of this year’s Electrolux Design Lab entries. See the interview here.